If upon hearing there is a new Frankenstein movie your first thought will be ‘Why on earth should I watch another Frankenstein movie?’ I can tell you that Bernard Rose mastered the incredible magic trick of adapting the classic Mary Shelley story as the ultimate version for the here and now. Frankenstein and his wife (Carrie-Anne Moss) are incredibly proud of the impeccable creation they gave birth to, cheering his every new move. However, soon visible signs start to show that something is wrong. The Creature’s cells are not as stable as expected and rashes and eruptions are spreading on his beautiful face. The creation has become flawed and it is decided that he has to be discarded. Even as Frankenstein’s wife has become quite attached to the Creature she eventually agrees to terminate his life. And so the scientists put their first effort in creating life down with a deadly injection, much like a convict on death row, aware their next attempt will produce a better version. Despite any expectation the Creature awakens again and flees from the clinic. Confused and completely unprepared for the outside world, without money or food, unable to express his feelings employing language and his face covered with eruptions the Creature stumbles along a modern LA. But in this cold world he is only met with hatred and fear and encounters with others mostly end in destruction and death. Only in the blind, warm-hearted homeless Eddie (simply awesome: Tony ‘Candyman’ Todd) the Creature finally finds a friend. When the Creature introduces himself as ‘Monster’ Eddie assumes it’s just a cool street name, yet it’s the only name the Creature has ever been given by other people. Monster flourishes under Eddie’s care and is being taught how to survive on the streets of LA. Happiness doesn’t last very long for Monster and due to a chain of tragic events he eventually finds himself alone again. But he has found the address of his ‘mother’ and now his sole aspiration is to find the woman who first gave him comfort when he was born. Bernard Rose’s Frankenstein is not your classic horror film. It is a highly intelligent and very soulful horror drama. Frankenstein features many tragic scenes that are so heartbreaking I found my eyes tearing up more than once. The pain and terror that the Creature has to endure are sometimes hard to take and Rose uses the graphic violence to generate even more empathy for the Creature/Monster/Adam. 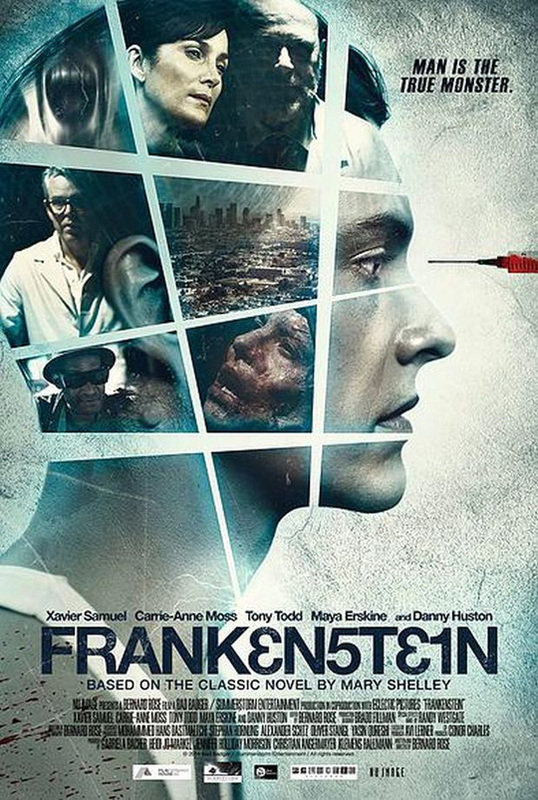 Bernard Rose finds the perfect balance between very poetic pictures and graphic violence for his gripping narration and Frankenstein will stay with you for a long while after initially watching it. While Huston and Moss embody a perfect modern Mr. & Mrs. Frankenstein it’s the outstanding performances of Xavier Samuel as Monster/Adam and Tony Todd as Eddie that add incredible depth and soulfulness to the movie. For me, Frankenstein is not only a horror drama. It’s very much like holding up a mirror to modern society showing how we all often treat people that we don’t know and that are different. As it says on the poster for Frankenstein ‘Man is the true Monster’ – that phrase is very much true. Society has generally become very cold and ignorant and seems void of any kind of empathy – not only in Rose’s cinematic version. Also, I perceived Frankenstein as a metaphor of modern parenting. In these times, when you can practically buy a child, given the right amount of money, it also shows the immense pressure that parents put on their kids. They want their children to be beautiful, highly intelligent and awesome – always. As soon as the offspring don’t meet the sky-high expectations of their parents anymore they become a disappointment and a failure, which is incredibly sad. I am very happy to have had the pleasure of seeing Frankenstein at its world premiere at the BIFFF in Brussels and I am very pleased that Frankenstein has been awarded with the Golden Raven, the Grand Prize of the festival. An honour very much deserved!